This module provides a quick review of dynamic programming, but the student is assumed to have seen it before. The parallel programming environment is NVIDIA's CUDA environment for graphics cards (GPGPU - general purpose graphics processing units). The CUDA environment simultaneously operates with a fast shared memory and a much slower global memory, and thus has aspects of shared-memory parallel computing and distributed computing. 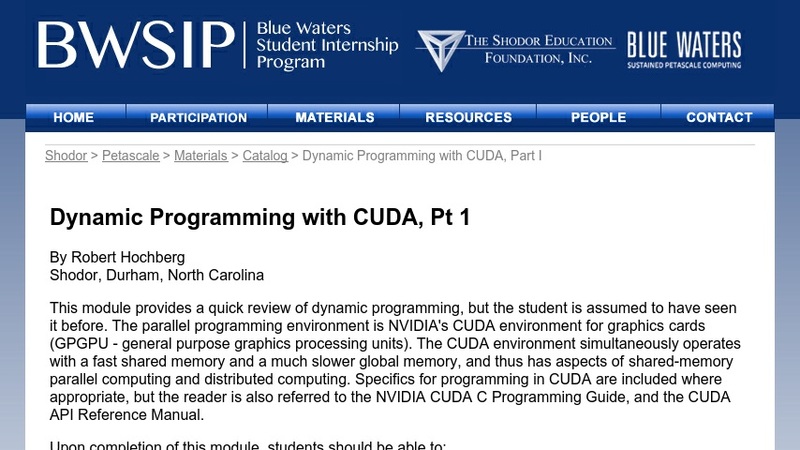 Specifics for programming in CUDA are included where appropriate, but the reader is also referred to the NVIDIA CUDA C Programming Guide, and the CUDA API Reference Manual.